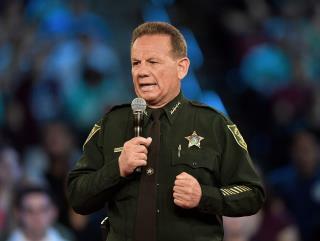 (Newser) – There's a new sheriff in Broward County, Fla. That's because Scott Israel, the one in that job during the February shooting at Marjory Stoneman Douglas High School, has been suspended by Florida Gov. Ron DeSantis, per the Hill. Israel was removed from his post for "repeated failures, incompetence and neglect of duty," DeSantis tweeted Friday afternoon, adding in a statement that Israel "has repeatedly failed and has demonstrated a pattern of poor leadership. … The families of the victims deserve accountability." Israel, 62, had been criticized by both lawmakers and families of the shooting victims after reports emerged that his office had received nearly 20 tips on the accused gunman before the shooting. Many in Parkland also faulted Israel for the way his deputies responded during the shooting itself, crouching behind cars and trees instead of rushing into the school, per the Sun Sentinel. Where the hell was the former Governor on this? BSO is a complete joke and will likely never be a department that is competent and professional. But leaving the top Sheriff in place was insane. I am glad the new Governor corrected this. The new guy is a veteran of a real police department, CSPD, that ran past the Broward cowards. I don't know. Maybe the Governor is doing the right thing. Or maybe he just serving up a "sacrificial lamb" to shift the focus of blame. I don't know. I do know it's easy to say what should have been after the fact. Hindsight is sooo 20-20. Sheriff Israel was a Republican before he switched to Democrat when he ran for the sheriff.